The Scottish philosopher, David Hume (1711-1776) has been the subject of special interest at McGill since the late 1940s, and McGill has one of the major scholarly Hume collections. Just before the end of 2015, Rare Books and Special Collections acquired a volume from David Hume’s library to add to its already existing holdings. This new addition is a copy of Gian Battista Guarini’s Il pastor fido, Paris: Prault, 1766. It is just possible that Hume acquired this copy of the pastoral dramatic best-seller, first published in 1585, during his last days in Paris in January 1766. He had been in Paris since October 1763 as Secretary to the British Ambassador, the Earl of Hertford. Or, it is possible that it might have been in the package of books sent to him by Jean le Ronde d’Alembert in the summer of 1767. When David Hume died in 1776, his library passed to various members of his family, and to his nephew, David, Baron Hume, and the present volume has the inscription “Baron Hume 1829” on the front fly-leaf. On the latter’s death in 1840, the library was dispersed. The philosopher’s library and its history has been reconstructed by the late McGill professor David Fate Norton and his wife Mary J. Norton in The David Hume Library (Edinburgh: Edinburgh Bibliographical Society in association with the National Library of Scotland, 1996). 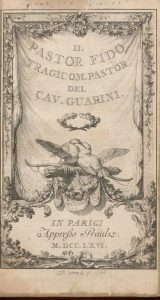 The Guarini volume appears in the Norton’s bibliography as entry #559. In 2014, Rare Books and Special Collections acquired two volumes from Hume’s library printed by the Birmingham printer John Baskerville (1706-1775) well known for his fine press work. The first of these volumes contains texts of the Latin authors Terence (published in 1772), and Sallust and Florus (published in 1773); and the second volume has texts by Catullus, Tibullus Propertius (published in 1772) and Lucretius (also published in 1772). The volumes are bound in contemporary russia and are re-backed, and the title page of volume one is inscribed “Baron Hume, 1829”. These volumes appear as entry #106: B, C, D and E in the Norton’s bibliography. The acquisition of these two volumes was made possible with funds from the David C. Edwards Endowment Fund. These titles join a number of others from Hume’s library held by Rare Books and Special Collections. These include works by Theophrastus (1612) entry #1250, and Anacreon (1695), as well as the Abbé de Mably’s Observations sur l’histoire de France (1765) (for both of the latter see Norton page 18), and the nine volume 1740-1742 Olivetus Paris edition of Cicero entry #275. The books from Hume’s library also include a volume of eight pamphlets concerning the Edinburgh theatre in the 1750s and in particular John Hume’s play Douglas. 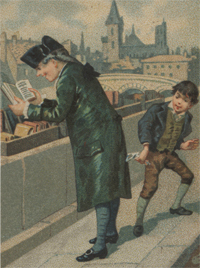 Among the pamphlets are a copy of John Maclaurin, Lord Dreghorn’s The deposition, or, Fatal miscarriage (1757? ), a copy of Chevy-Chase (1754) and a copy of The Immorality of stage-plays in general, and of the tragedy called Douglas, in particular, briefly illustrated: in a letter from Athelstaneford to the Moderator of the Presbytery of Haddingtoun (1757). For all of these volumes, see Norton, entry # 630. The first four titles had been in the library for many years and had been identified by Prof. Raymond Klibansky (1905-2005); the volume of pamphlets was acquired in 1987. 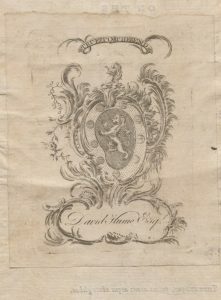 Not in the Norton catalogue but now in the McGill collection is Robert Wallace’s A dissertation on the numbers of mankind (1753) with David Hume’s bookplate. It comes from the library of Raymond Klibansky, now held in Rare Books and Special Collections. Norton & Norton, p. 27, n. 43. This entry was posted in Blog by Richard Virr. Bookmark the permalink.